The Tigers' starting rotation has the second-worst walk rate in the American League (nearly four walks per nine innings). The Tigers' offense also has the second-worst walk rate in the American League (6.6 percent). As of Wednesday morning, the Tigers are 9-10 and back under .500 for the second time this season. All of these things are related. It takes runs to win games, and it takes runners to score runs. You knew that much, of course. But it also takes a small, sweet kiss from Lady Luck to make sure all of your baserunners get clustered into the same few innings, instead of being spread harmlessly across the entire game. Joe Peta first coined the term "cluster luck" to describe this phenomena in his book Trading Bases: How a Wall Street Trader Made a Fortune Betting on Baseball. The Braves, Mets, and A's were all perfectly average in their ability to convert hits to runs. The Red Sox were extra-efficient (or perhaps got some extra cluster luck), and the Reds and Tigers should have each scored at least two more runs based on our run conversion baseline of "two hits equals one run." Of course, it's not all luck. The Tigers were somewhat unlucky to convert six hits into only one run, but there's also the fact that they only got one extra-base hit all night. It's much easier to convert hits to runs when you're smacking doubles, triples, and dingers. Teams with higher OPS numbers tend to be better at out-performing the "two hits to one run" rule. It also helps to draw walks (and the Tigers got exactly zero walks last night). It's easier to remember "three baserunners to one run," but in reality it's closer to 2.75 baserunners per run. Adding walks to the mix waters down the ratio and makes those base hits more valuable. 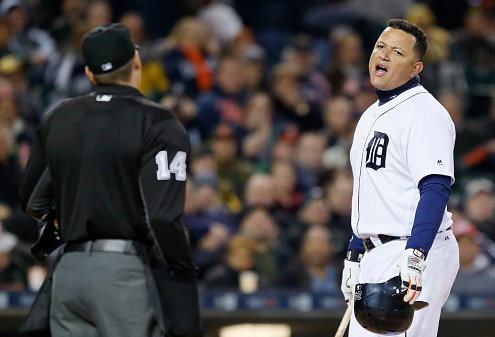 As we've seen over and over with the Tigers in the past few years, you can't always expect the big sluggers to be slugging big 100 percent of the time. When those big bats go quiet, it's the walks that help make up for the temporary loss of power. The Mariners are the third-highest scoring team in the American League right now, despite having a team OPS of only .700 (tenth in the league). The Orioles are only the sixth-highest scoring team in the AL, and their team OPS of .784 is best in the league. The Mariners have a walk rate of 8.7 percent, and the Orioles have a walk rate of 8 percent. More baserunners = more runs. Right away we can see that they've been either slightly unlucky or just plain-old inefficient (or both) at converting runners to runs, because even an average team should have produced 3.5 more runs than the Tigers did. The other thing to notice is the incredibly low walk-to-hit ratio. Averaging 1.7 walks per game is well below the MLB average (over the past five years) of three walks per game. If we imagine the Tigers drawing the average number of walks, they would have had 30 walks in the last ten games, for 108 baserunners and 39 runs. The Tigers' offense is averaging 11.3 baserunners per game at the moment. The pitching staff collectively has a WHIP (walks/hits per inning pitched) of 1.43, which equates to 12.9 baserunners per game. Pitching: 12.9 baserunners/2.75 = 4.7 runs per game = 672 runs allowed for the rest of the season. Hitting: 11.3 baserunners/2.75 = 4.1 runs per game = 586 runs scored for the rest of the season. Run those numbers through a Pythagorean Expectation calculator and you get a win percentage of .432 for the rest of the season, for a final season record of 71-91. In the world of advanced math and sabermetrics, we call that "last place." But what if the Tigers' offense could add just one more walk per game, and the pitching staff could eliminate just one extra walk per game? Pitching: 11.9 baserunners/2.75 = 4.3 runs per game = 614 runs allowed for the rest of the season. Hitting: 12.3 baserunners/2.75 = 4.5 runs per game = 644 runs scored for the rest of the season. That would yield a .524 win percentage for the rest of the season, for a final record of 84-78. That's still probably only good enough for third place, given the way the White Sox and Royals are playing, but there's possibly some good news here. Yes, the pitching staff is averaging 12.9 baserunners per game, but that includes some highly inflated numbers from Mike Pelfrey, K-Rod, Anibal Sanchez, and Shane Greene, who have collectively allowed 10.5 more baserunners this season than their career averages. On the flip side, Ian Kinsler, Nick Castellanos, and Justin Upton are collectively drawing 0.4 walks per game, while their career averages put them at 1.04 walks per game -- a difference of 0.7 walks per game. Between a pitching staff that is giving up far more walks than usual, and an offense that is drawing far fewer walks than normal, is it possible that the team can add to the numbers above by adding just another 1 1/2 walks per game on the offense, and preventing an extra 1 1/2 walks per game on the pitching side? I think it is. Pitching: 11.4 baserunners/2.75 = 4.15 runs per game = 593 runs allowed for the rest of the season. Hitting: 12.8 baserunners/2.75 = 4.65 runs per game = 666 runs scored for the rest of the season. If the Tigers can get anywhere near these numbers, it would result in playing .558 baseball the rest of the way, ending in a win-loss record of 89-73. That should at least get them close to winning the division, or at least securing a Wild Card spot. Can they pull it off? Can the pitching staff eliminate that many walks? Can the hitters be a bit more selective at the plate?